You might call him "The Blues Everyman," just representing ordinary people, revealing basic feelings about relationships, be they romantic or business. Unlike many of his contemporaries, Jimmy Reed generally avoided really dire themes in his songs, most of which he wrote himself, preferring simple narratives of love gained or lost. Establishing a routine early, his songs all sounded markedly similar (a slow-to-medium shuffling beat, standard rhythm guitar riffs, casually appealing harmonica interludes and a vocal approach prone to lyric slurring), steering clear of the urgency conveyed by other '50s bluesmen. For some, a repetitious formula such as this might be good for one or two hit records, but in Reed's case it gained him a legion of followers; he averaged one or two hits per year for nearly a decade, becoming one of the most often-heard blues singers of the era. His storylines were simple and accessible, his sound a comfort zone one can return to time and time again...and his influence extended to music's elite: Mick Jagger based his vocal technique on the blues singers of the '50s, Reed in particular, and Elvis Presley just flat-out loved his music. Growing up in and around the small community of Dunleith in western Mississippi, Jimmy's family (ten kids in all) worked as sharecroppers. His friend, Eddie Taylor, was two years older and learned to play guitar and harmonica before reaching the age of ten, passing what he'd learned to Jimmy, who left the area at 18 and spent a short time in Chicago with his relocated older brother. After serving Naval duty during World War II, he returned to Mississippi and married his childhood sweetheart, Mary Lee Davis. In 1945, at 20 years of age, he returned to Chicago with his bride (his name for her was "Mama Reed," though she was sometimes more accurately called "The Boss Lady") and took a number of jobs (in the iron and coal industries, as a junk man and a janitor and at a meat packing company, to name a few) while occasionally playing his music in any local bar where the owner would let him. This continued for a few years, but his career was going nowhere. Mr. and Mama Reed moved to nearby Gary, Indiana in 1948. Later, Jimmy joined local group The Gary Kings, headed by blues guitarist John Brim, whose wife, Grace Brim, sang with the band. Brim put together an impressive run of singles in the early- to mid-'50s for the Fortune, Random, J.O.B., Parrot and Chess labels; in 1953 he was involved in the making of Jimmy Reed's very first recordings. After unsuccessfully auditioning for Chess in Chicago, Jimmy paid a visit to Vivian's record shop in Gary (owned by Vivian Carter) and got in on the ground floor of the record label, Vee-Jay, that she founded with partner James Bracken. Performing in the studio just as he did in clubs, sitting on a stool with his guitar and harmonica (mounted on a rack that hung from his neck), he recorded Vee-Jay's first release, "High and Lonesome" and its flip, "Roll and Rhumba," with backing from Brim's band. Vivian, having a tough time gaining traction with her new label, licensed the track to Chance Records, Art Sheridan's better-established label (she did the same with VJ's second record, "Baby it's You" by The Spaniels), though it also served as an introduction to her new enterprise, appearing as Vee-Jay 100. Eddie Taylor had moved to Chicago prior to Jimmy's arrival and although he didn't make records under his own name until much later, he was a regular session musician and often performed in local nightclubs. The childhood friends worked together for many years. Reed composed most of his own songs, keeping the melodies simple and in many cases similar. 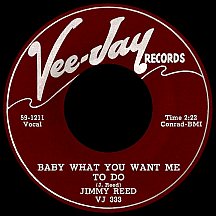 The third Vee-Jay single, "You Don't Have To Go," featured Taylor on guitar; an easygoing number telling a common story ('I'm gonna pack up, darlin'...down the road I go...'), it became a top ten R&B hit in the spring of 1955 and provided inspiration for many latter-day blues-based rockers. Taylor's mostly-uncredited creative input was ongoing in his long association with Reed, along with others who impacted his career long-term. Bandleader Al Smith, who arranged and conducted many sessions for Vee-Jay artists (The El Dorados, Spaniels and others) and had several of his own instrumental singles, was Reed's manager, an occasional songwriter who later supplied the singer with one of his greatest hits. "Mama Reed" composed a few gems for Jimmy and it's been suggested she collaborated on much of the material he took sole credit for. 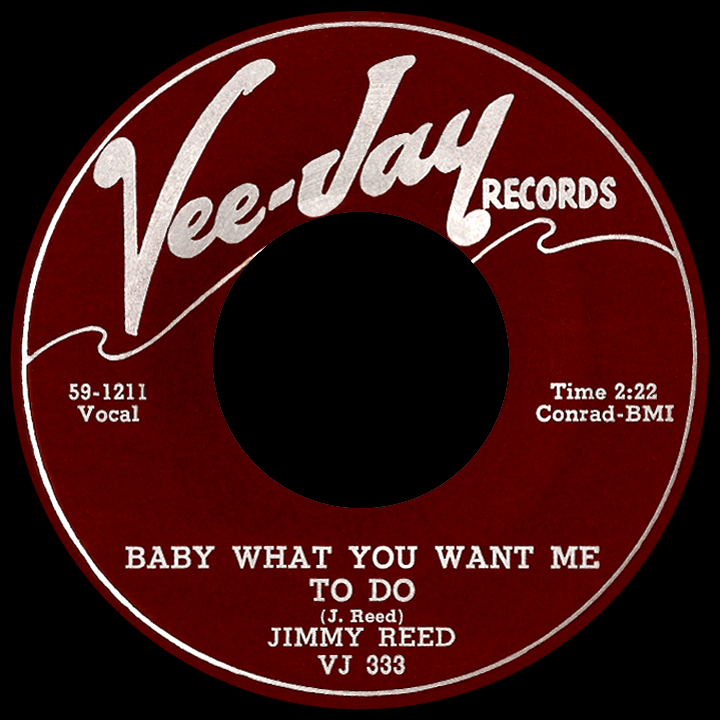 Eventual married couple Vivian ("Vee") and James ("Jay") Bracken were as cooperative as any record company owners could be, allowing Reed to follow his set formula as long as it worked, which it did for nearly the entire existence of the Vee-Jay label. As time rolled on, Jimmy took to drink more heavily, gradually making him less reliable and forcing those around him to take up the slack whenever possible. Erratic (and often downright rude) behavior at live appearances, should he bother to show up at all, made him something of an outcast within the business, shunned by fellow performers. Lines like 'They may kill me, baby...bury just like they do...my body might lie, but my spirit gonna rise and come home to you,' from his spring '56 hit "Ain't That Lovin' You Baby," came across as morbidly negative and assertively positive at the same time, wrapped up in a feel-good arrangement typical of Reed's work. "You've Got Me Dizzy" was his third top ten R&B seller in under two years, then in the summer of '57 "The Sun is Shining" placed him on the pop charts for the first time, a sign of mainstream acceptance that would strengthen over the next half-decade. "Honest I Do" revealed a frustration beneath the surface ('I told ya I love you, stop driving me mad...when I woke up this morning, I never felt so bad...') and didn't seem a prime candidate to cross over to pop radio, yet that fall it became his first top 40 hit, selling better than any previous release; seven years later it reached a much larger audience and provided Reed with a fat wad of royalty money when Brit Invaders The Rolling Stones included it on their debut album. Around this time Jimmy began experiencing epileptic seizures, his increasing use of alcohol complicating the condition; these random attacks occurred frequently throughout the remainder of his life. As Reed's health deteriorated, his star power continued to rise as the developing string of hits placed him second only to B.B. King among popular blues acts of the era. 1958 hits "Down in Virginia" and "I'm Gonna Get My Baby" both credited Mary Reed as cowriter; his wife remained by his side for many years, doing her part to prop him up, so to say, as alcoholism and poor health gradually took its toll. The story of how she sat near him in recording sessions, whispering the words in his ear while he sang, has become legendary; close friend Eddie Taylor did his part, too, participating in the studio as a director of sorts, cueing him on when to sing or play should he be impaired past the point of reasonable awareness. "Baby What You Want Me To Do" gives us one of Reed's greatest moments, a catchy original that could be his most remade song (The Everly Brothers, Johnny Rivers, "Silver Throat" Bill Cosby, Erma Franklin and Elvis, on his '68 TV special, were among the many ardent believers, while Etta James hit the charts with her version in 1964); 'Got me peepin'...got me hidin'...got me peep, hide, hide, peep, anyway you wanna, let it roll...yeah, yeah, yeah...' was his ticket back to the pop top 40 in February 1960. "Found Love," despite a generalized romantic theme, contained a politically paranoiac comment: 'It's hard to believe the condition the world is in...you can't trust nobody and girl you know it's a sin.' "Hush-Hush" ('If ya don't stop yakkin' you're gonna drive me outta my mind!') added to his string of hits in late 1960, followed by "Close Together," featuring one of the best examples of Mary's background vocals (that were never specifically designed to be part of the recordings); she can be heard clearly in the distance on this track, taking the brilliance of it up a notch. "Big Boss Man" is likely the most familiar of Reed's hits, though it's one of the few he didn't compose. Penned by Al Smith and Luther Dixon, the track broaches a subject all-too-familiar to the blue collar class. When Jimmy (and Mama Reed behind him) states, with conviction, 'Well, you ain't so big...you just tall, that's all!,' it rings true for millions; Elvis Presley's 1967 remake cemented the song's status as a working man's protest song. Jimmy wrapped 1961 with "Bright Lights Big City," a number three Billboard R&B hit (his highest-charting single) that also brought him a Grammy nomination for Best Rhythm and Blues Recording. He was on a roll the next year or so, with "Aw Shucks, Hush Your Mouth," Mary's "Good Lover" (also a 'natural born lover' and 'real gone lover' according to the lyrics, so Mama must have known something we don't) and the more-uptempo-than-usual "Shame, Shame, Shame." 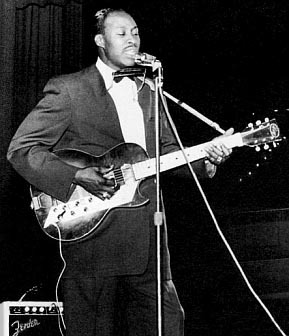 In 1963, inspired by The Rooftop Singers' use of the 12-string guitar on their hit "Walk Right In," he made an unusual move for a vocalist, recording an entire album of instrumentals, Jimmy Reed Plays 12 String Guitar Blues, which included several of his own hits arranged identical to the originals, most of them substituting the vocals for his trademark harmonica breaks. "Mary-Mary" from mid-'63 is undoubtedly a love letter to his wife ('Baby you da one for me! ')...an answer song, maybe, to the aforementioned "Good Lover"? It was his last significant single for Vee-Jay Records, capping an eventful eight-year run of hits. Right around that time several blues-inspired, and soon-to-be high-profile, rock acts from England were gearing up to spread the word about his music. All in all he was with Vee-Jay for 13 years, right up until financial difficulties ending in bankruptcy forced Vivian and James to shut down the operation in 1966. Reed moved on; "Knockin' at Your Door," on the Exodus label, was written by Sax Kari, who'd produced and arranged his fair share of recordings by various VJ artists; Jimmy's rendition sonically mirrored his previous work and appeared briefly on the R&B charts that summer. Smith pulled a few strings and in late 1966 he got his old-school, harmonica-'round-the-neck pal a contract with ABC's Bluesway label, where B.B. 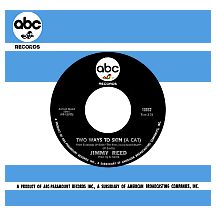 King would soon be making the scene, christening a three-year series of singles and albums with "Two Ways (To Skin a Cat)," another by-the-numbers Reed-style blues tune. One thing was obvious after all those years: progression was not in Jimmy's genes. Around this time he became desperate to the point of accepting ten thousand dollars from Arc Publishers for control of all the songs he'd written. In the early '70s, he made a few records for small labels RRG, Roker, Canyon and Blues on Blues. His death in 1976 came sooner than it does for most, at age 50, but considering his physical struggles and unchecked abuse of hard drink, it's doubtful those close to him were surprised by his passing. Several years later, Mary Reed, who'd separated from her husband in the early '70s, sued Arc over the arrangement that secured the rights to his songwriting catalog, receiving a more saisfactory monetary settlement from the company. 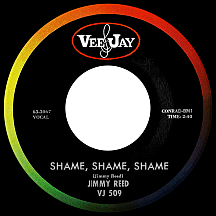 Hopefully, Jimmy Reed won't ultimately be pushed so far into the distant regions of music memory as to be banished to some infinitesimal corner on a brittle scrap of outdated microfilm. I don't think it will happen; at the very least, recordings like the Stones' take on "Honest I Do," Elvis's hit remake of "Big Boss Man" and the many versions of "Baby What You Want Me To Do" will motivate future listeners to ask questions like "Where did these great songs come from? "...and it will be well worth making the effort to find out the answer.